Supergirl and her friends have had their hands full this season dealing with the Children of Liberty's anti-alien stance and The Elite's radical response, but tonight someone who has the potential to be a much more dangerous threat comes to National City -- Lex Luthor. So what happens when Lex Luthor comes to town? Here's what happened on "O Brother, Where Art Thou?" Warning: Full spoilers for Supergirl beyond this point. We open four years ago in Metropolis where Lex has bound Lena to a chair, chaos unfolding all through the city because of his catastrophic plan to kill Superman. Insisting that he, not Superman is the Man of Tomorrow, Lex is ultimately arrested. In the present, a helicopter delivers a frail Lex to Lena at her home. Meanwhile at CatCo, James lies bleeding out on the floor of his office, but his shooter uses the distress signal on James' watch to alert Supergirl. The shooter is gone by the time she arrives to aid a near-death James. Lex has been released from prison and into her care because he’s dying from kryptonite exposure poisoning-related cancer His only chance at survival is Lena's Harun-El experiments. Eve comes in to tell Lena about James. At the hospital, we learn that James was hit in the spine. J'onn shows up and blames Manchester Black for the attack on James and grows even more determined to stop him. With James' situation still dire, Alex speaks with Lena and tries to convince her to use the Harun-El to save him. Lena is reluctant, but suddenly has an idea. J'onn decides to go after Manchester and Kara decides to go with him, lying to Alex that she's going to take care of things at CatCo. The pair find Manchester where M'yrnn died and Manchester has somehow gotten ahold of the Staff of Kalar, too. Lena, desperate to help James, tells Lex about the situation and asks for his help due to his expertise about kryptonite. Her goal? Separate the superpowers part of things that she's been working from the curative aspect. While Lena tries to solve things, those waiting at the hospital struggle with James' situation. Nia blames herself, Brainy blames himself, everyone cries. James has been put in a medically induced coma, and when Alex attempts to make decisions for his care, she's refused as only family can do that. Right on time, James' sister Kelly arrives, granting Alex access. James' condition gets worse. He has internal bleeding and needs surgery which Kelly approves. Privately, Alex tells her about Lena's cure, but Kelly wants to do the surgery as she's worried James might die but also doesn't trust Lena because she's a Luthor. With the clock ticking on James' life, Lex and Lena test the Harun-El on a cancer-ridden heart. It works. When Lena hears that James is undergoing surgery, though, she's upset by it, but Lex tells her to go to him. At the hospital, Kelly and Alex bond, Kara and J'onn show up, as do Lena and Eve. Brainy and Eve struggle with their emotions about the James situation and end up kissing just as the lights begin to flicker. The lights are flickering at Lena's house, too. Then, J'onn realizes that Manchester is at the dam and messing with the power. When the power goes out while James is in surgery and the generators don't kick in, Supergirl and J'onn go after Manchester. Desperate to save James, Kelly agrees to Lena's cure. Lena goes into the operating room, orders the doctors and nurses to leave. She injects James with the cure and he immediately begins to heal and wakes up. At the dam, J'onn and Manchester fight with J'onn ultimately killing Manchester with the staff. He collects Brainy's stolen Legion ring from the ground. With James saved, Lena notices something about a light. J'onn struggles with what he's done and tells Kara he is not a man of peace. 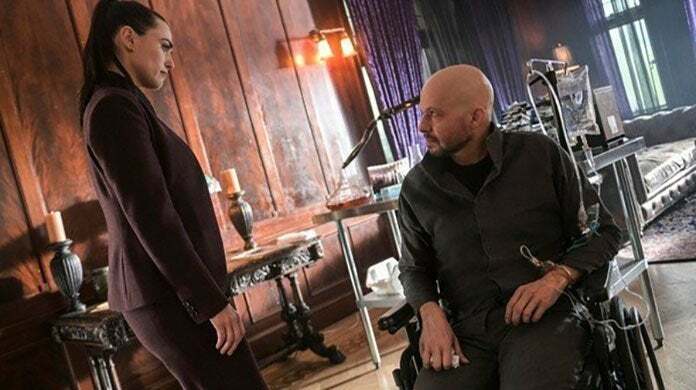 Back at home Lena puts together that James needing the serum was all part of Lex's plan -- which he admits, including that he had James shot in the first place. Lena refuses to give Lex the cure but she's too late. Lex already took it; the guard is revealed to be a very alive Otis Graves and Eve walks in with a gun having been working for Lex the whole time. Lex and Otis kill the remaining guards and police and escape in the helicopter only for Supergirl to fly into their path. Lex declares it's nice to finally meet her. Brainy decides he and Nia can't be together. J'onn retrieves Brainy's ring, but leaves Kara to give it to him. Kara tells J'onn she will stand with him no matter what path he chooses. Lex was behind Lena working with the DEO on her serum. What did you think of tonight's episode? Let us know in comments! Additional reporting by Emily Donn.